Amazing value! I put these above the center island in my kitchen and they look stunning. The quality is in real for the price! 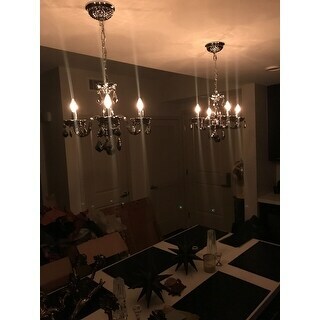 This stunning 4-light Crystal Chandelier only uses the best quality material and workmanship ensuring a beautiful heirloom quality piece. 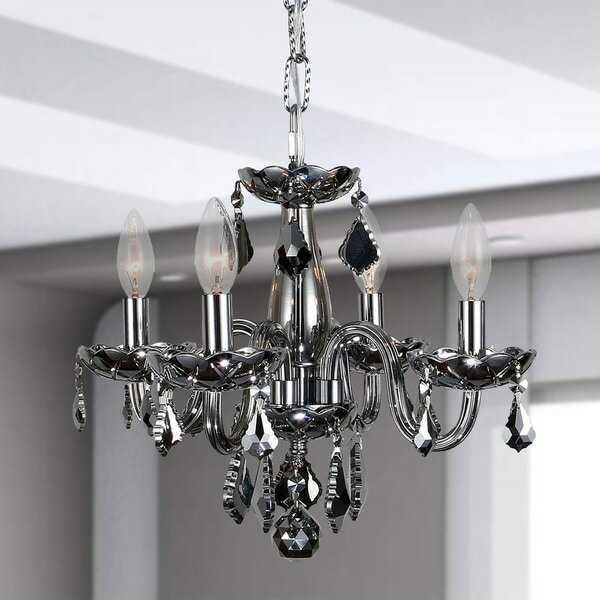 Featuring a radiant Chrome Finish and finely cut Premium Grade reflective Chrome-colored Crystals with a lead content of 30-percent, this elegant chandelier will give any room sparkle. WARNING:Attention California residents: This product may contain lead, a chemical known to the State of California to cause cancer and birth defects or other reproductive harm. This is simply a stunning chandelier. The chrome color is just beautiful. Looks great. Love it! No I do not recommend this item. It is not well made. The hanging tabs to attach the crystals to the fixture are very thin and easy to break and do not hold the crystals on to the fixture very well. I got all the crystals on the fixture and had it sitting on my granddaughters toddler chair. The fixture fell on to a rug and one of the candelabra arms broke off. It could not have fallen more than 10 inches. The arm is made of a man made material and obviously is not sturdy at all. So it never got installed. Great way to update a room. Superior quality and elegant look. The price is great considering the great quality. It also comes with a polishing cloth which was a nice touch. Perfect color and value. I love Overstock for their options and real quality. Best buying choice. Beautiful and the price was perfect!! !